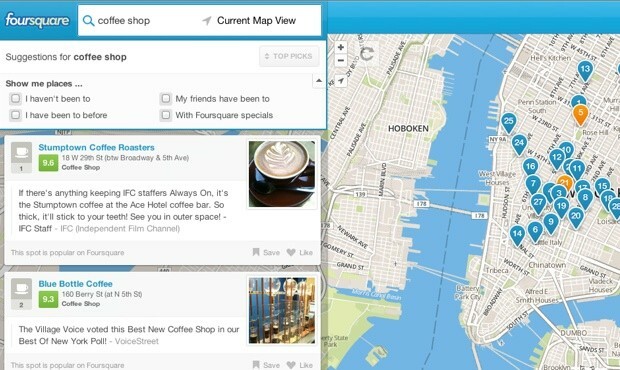 Foursquare just launched a redesigned desktop interface that everyone, not just members, can use for local listings and business recommendations. The company has been on this trajectory for awhile now, especially with the latest Explore map that provides a more tailored search experience for logged-in users. This is all in line with co-founder and CEO Dennis Crowley's promise that Foursquare is more than just a simple social service; that it serves as a discovery and recommendation engine much like Yelp or Google. Leveraging over 3 billion check-ins and 30 million tips from its community of nearly 25 million members, the New York-based firm is confident it can offer reliable recommendations to the general public. It's still beneficial to join up -- you get personalized filters and access to that handy mobile app -- but it's no longer necessary if you just want know where to get a quick sushi fix. Foursquare launches local search for all, goes after the likes of Yelp and Google originally appeared on Engadget on Tue, 16 Oct 2012 06:31:00 EDT. Please see our terms for use of feeds.